Getting humanitarian aid into Venezuela is the top immediate priority for lawmakers, but Nicolás Maduro’s military is blocking it. So Florida Sen. Marco Rubio named six top military officials on Monday who he said would receive amnesty from U.S. sanctions and immunity from Venezuela’s opposition-controlled National Assembly if they allow aid to be distributed by non-governmental organizations inside the country. Some of the six are already under sanctions from the U.S. government for being part of Maduro’s inner circle and for leading “violence and repression” efforts against protesters, according to the Treasury Department. Rubio, who has the president’s ear on Latin America policy, named six Venezuelan military officials who could help get aid into the country if they are willing to defy Maduro: Gen. Vladimir Padrino, Maduro’s defense minister; Adm. Remigio Ceballos, admiral in chief of the armed forces; Maj. Gen. Jesús Rafael Suárez Chourio; Adm. Giuseppe Alessandrello Cimadevilla, head of the navy, Maj. Gen. Edgar Valentín Cruz Arteaga and Maj. Gen. Antonio Benavides Torres. 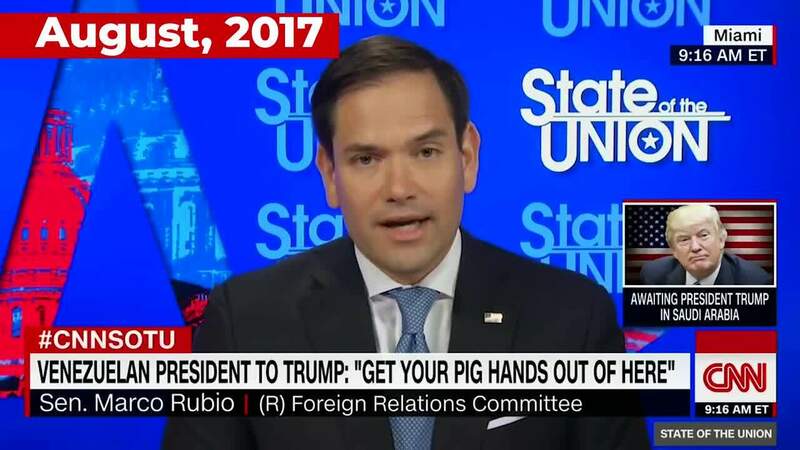 Rubio noted that the U.S. government and its allies will aggressively seize the assets of Maduro loyalists who do not defect or aid Guaido’s government. He also said the National Assembly will need a functioning military to restore order during a transition to democratic elections and that rank-and-file members of the military will not shoot unarmed protesters and people trying to receive aid, leaving the generals with a choice to back Maduro or defy orders.